Just last week in the reception area and reception boardroom, Telsec treated its office-space tenants to some holiday cheer and some amazing catered hors’douvres by Daniel et Daniel. It was great for tenants to have a chance to gather and be around other office tenants. Some took the time to talk to familiar faces they had seen or talked to in the hall, while some of the newer tenants got a chance to meet some of the other office tenants who have been around for a while and do some networking. 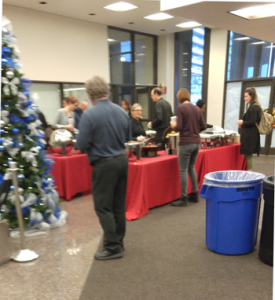 On December 16th at the Toronto Star Building, all of the building tenants and Toronto Star staff were treated to a holiday breakfast in the main-floor lobby of the building. It was not a simple breakfast. They had a various selection of food, breakfast deserts and different beverages. Some of the food included western omelet, scrambled eggs, sausages, biscuits and gravy, croissants, danishes, various juices, hot apple cider and coffee. They even had a live musical group performing popular holiday music. This was not the first time that the building management has organized this type of event. Each summer they treat building tenants to a BBQ. Back in 2013, I wrote a blog about the Toronto Star Building Triovest BBQ, where they encouraged people to bring a non-perishable food item for the Daily Bread Food Bank. 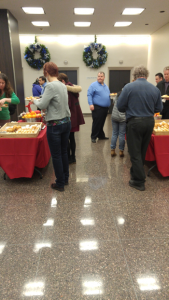 Once again, this year’s breakfast event also encouraged people to donate food for the food bank and make a donation to the Toronto Star Santa Claus Fund and toy drive. 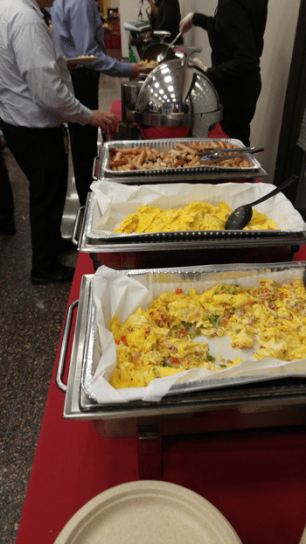 Why are we writing about this free breakfast event for tenants at the Toronto Star Building? Because we had a potential office rental tenant visiting our business centre to take an early tour of our facilities. He was so impressed by the holiday spirit of the building (and the fact that our was staff encouraged to go down and have some breakfast), that he signed up for a small private office with Telsec. When looking to rent serviced office space at a business centre, you might also want to learn about the building amenities and features. Sometimes a building’s amenities, people and ambiance will help you decide on a business location that also makes you feel like you are still at home.